We are committed to meeting your specification requirements. We have supplied planters to top landscape architects, contractors, and designers for more than 25 years and have 30 years of experience in the rotational molding process. Can't find what you are looking for? Give us the opportunity to create it. Many of the designs were created for specific projects. Low Bowls 30" + O. D.
Round - Dia. 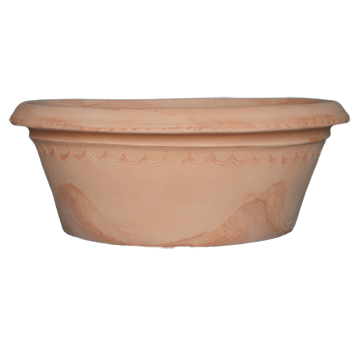 24" to 29"
Low Bowls 24" to 29" O. D.
Large Conca Ligure terracotta pots are manufactured in Italy. This Italian rotational molder has perfected the process of creating a lightweight poly pot that is not only durable, but also replicates aged terracotta clay pots. 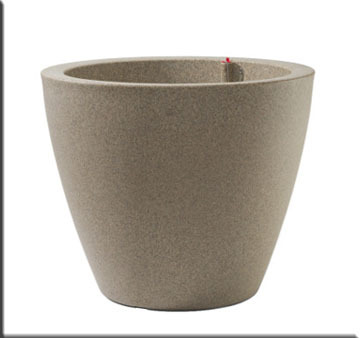 Available in three sizes Conca Ligure planters boast up to 16" heights with a 40" Top O.D. Virtually industrictible, architectural grade rotationally molded designer polymer resin. Conca Ligure planters are UV protected from sun light and have excellent freeze/thaw characteristics. Conca Ligure terracotta pots can handle the most inclement weather conditions. Landscape architects, interiorscapers, landscape contractors and interior designers have utlized this Italian resource for ease in installation without compromising the the beauty of specifiying aged clay terracotta pots for their projects. Planters can be easily drilled for drainage specific to environment and vegetation requirements. Planters F.O.B. Florence, South Carolina ensuring prompt delivery throughout the United States. Rotationally molded Conca Ligure terrcotta pots represent a viable lightweight alternative to conventional planters of clay, concrete or aggregate materials. Conca Ligure planters are up to 50% lighter than terracotta or concrete planters allowing easy installations. These architectural quality planters have an extra thick wall for strength and durability. Products are manufactured with polymer resin and can be recycled. 10 Year Limited Factory Warranty. Planter Part # Ref. # Length x Width Liters Base ID Ht.